Commemorate the institution of the sacrament of holy communion with a service of Solemn Eucharist and Foot Washing on April 18 at 7:30 pm. 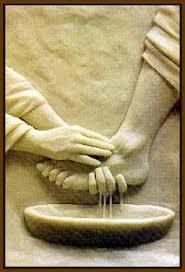 Jesus’s command to “love one another” is symbolized in the washing of our neighbor’s feet. After communion, the Altar is stripped and the already blessed communion elements are moved to the Altar of Repose in the Lady Chapel, while the congregation leaves in silence.